At 14 years old, Arbenita was an only child, born into a violent and abusive family. Every night, she'd lock herself in her room, put in her earbuds, close her eyes, and lose herself in the music of electropop. She was a girl of few words, but the music was her voice. When Arbenita listened, she felt herself come alive. When she was cold and alone, the music made her soul warm and comforting. One night, that warmth she cherished became something more, and upon opening her eyes, her room was engulfed in flames. As her heart raced, pounding to the beat of the music streaming through her ears, she saw something amazing- A coil of pink and purple flames swirling around her entire room. Everything was ablaze, including her body. It hurt more than anything she had ever experienced, but not even the pain could pull her attention away from the colorful phenomenon. Before passing out, she saw a glimpse of a creature's face emerge from the flames. The fire was alive. Arbenita awoke sometime later, in a strange place she had never been before. She was laying on a dirty cot in an empty room. Upon getting up, a woman with a smile entered. Arbenita was confused about what had happened, or where she was, but all the woman knew was that she had found her on the outskirts of town, partially burned and left for dead. Arbenita asked where she was. The woman replied, "VOID City". It was a name Arbenita had never heard of, but without even considering her family, her home, or her life before the fire, she was happy to have escaped into this new mysterious city. When Arbenita was found, all that was found on her that stayed intact were her music player, and earbuds. Arbenita stayed with the woman for the next couple weeks while her body recuperated. The woman's name was Tabitha, and she had been a resident of VOID nearly her entire life. She'd seen her share of violence and death in this crazy city, but when she came across a young girl, burned and nearly dead, she knew she had to help. Both Arbenita and Tabitha were surprised to see that the burns had nearly completely healed in such short time, especially since they were initially 2nd to 3rd degree burns. Once fully healed, Arbenita thanked Tabitha and left to explore this new city- her new home. As she wandered the gritty streets of VOID, a new fear overcame her. VOID was not the escape she had been hoping for. Tabitha had warned her of the violence the city was constantly under, but nothing could ever prepare her for what she saw. Strange beings with strange powers, killing, for what seemed like sport. The sight of violence made Arbenita want to seclude herself once again. She needed her music. She put in her earbuds, closed her eyes, and once again yearned for the warmth. This time it came instantly. She opened her eyes, and she was engulfed in flames- but this time there was no pain. the pink and purple flames coiled around her once again. She felt powerful. She felt invincible. Nearby street thugs approached the fiery young girl, hungry for a new and challenging fight. Before they could make their move, Arbenita struck first, with what seemed like second nature. With a flick of her wrist, the flame curled around her arm, then shot out in a swooping motion towards her attackers. Upon impact, they were set ablaze. Arbenita watched as they fled screaming, still on fire. She then pulled off her earbuds to fully grasp what had just taken place. At that moment, the flames dissapeared. The warmth was gone. She was once again afraid. Arbenita immediately put her earbuds back into her ears, and the flames curled around her body once more. She then saw it again- The creature. It had the head of what looked like a dragon, and from the neck down, like an ever-continuous snake, all of which covered in pink and purple flames. She stared longingly into its eyes, as it stared back into hers. Whatever this creature was, it protected her. For the first time in Arbenita's life, she felt like she had someone who cared for her. Even if it was a dragon-snake made of flames. She then started to feel pain in her arm. The burns had returned, but only on her arm. 'It must have been when the flames curled around my arm for the attack', she thought. Although the fire kept her safe, she now knew it could also be the death of her. Arbenita had to be careful, not just of VOID City, but of herself. Over the next couple years, Arbenita and her new friend trained in solitude. She pushed herself to the limit, all in hopes of creating a stronger bond for her and the creature. Over time, it paid off. She could control the flames nearly 100%, being able to form the flames into almost any weapon or defense she could think of. But it all came at a price. Although her burns would heal over time, her arms had become perminantly burned. Her arms never felt pain anymore from the fire, but they never looked the same again. Despite this, Arbenita felt alive- more alive than ever before. 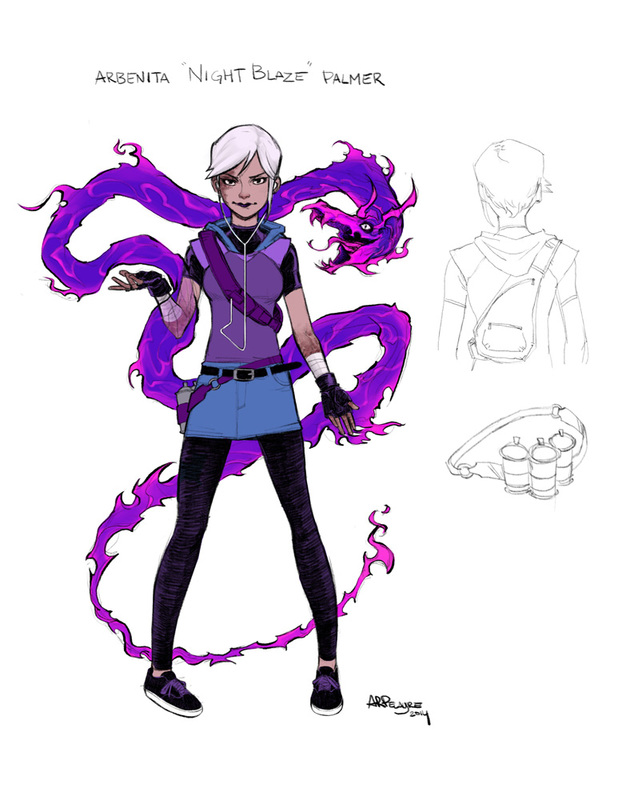 She assumed the name "Night Blaze", a name she had heard another VOID fighter refer to her as. She felt it was fitting and stuck with it. As long as Night Blaze had her music and her power, she felt safe living in VOID City. Nothing could bring her down ever again. Power: Posession of fire demon- brought to life through electropop music. Abilities: Form fire demon into almost any form, defensive or offensive.